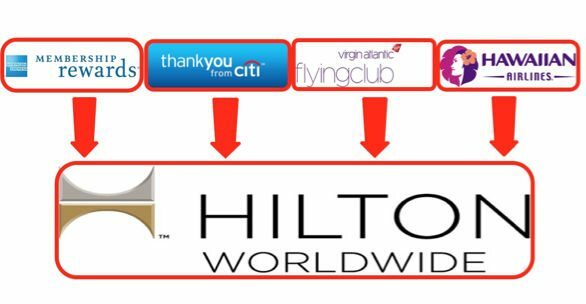 The sign-up bonus on the Citi Hilton HHonors card has been increased to 50,000 Hilton points plus a $50 statement credit after meeting minimum spending requirements. You could use 50,000 Hilton points to splurge on a night at a high-end hotel such as the Conrad Chicago. But some folks may prefer to stretch the bonus to cover 2 or 3 nights at nice, although less fancy, Hilton hotels. I’ll give you ideas and show you how! Make the Most of the Sign-Up Bonus! You can get more nights from the Citi Hilton HHonors 50,000 point sign-up bonus by using your Hilton points for stays at Hilton category 3 and 4 hotels. These cost 20,000 Hilton points per night (off-peak season for category 4). No Elite Status Required! 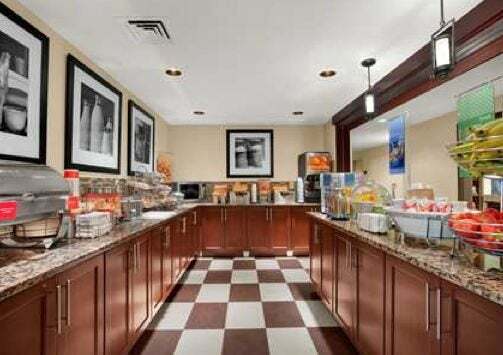 Many Category 3 and 4 Hilton Hotels Include Free Breakfast! Generally, you won’t find upscale brands in lower categories, and some locations aren’t centrally located. But many of these hotels are clean, modern, comfortable, and have lots of amenities. And some offer suites with kitchens, free breakfast, and family-friendly perks like pools and hot tubs. For example, at Hampton Inn you get free hot breakfasts, with fresh waffles. And an exercise room to burn it off! You could use 40,000 Hilton points for 2 nights at a nice category 3 or 4 hotel (and have 10,000 Hilton points left over from the sign-up bonus). For a 3rd night, you could combine what’s leftover with Hilton points already in your account. Or transfer miles and points from other award programs! Or, pay for the 3rd night. Then offset the cost with the $50 statement credit you’ll earn for your 1st Hilton stay in the 1st 3 months of opening your account! If you’re planning a Disney vacation or a visit with Harry Potter at Universal Orlando, the DoubleTree by Hilton Hotel at the Entrance to Universal Orlando is an excellent choice! It’s close to Disney parks and SeaWorld, too. This hotel is well reviewed by TripAdvisor. And it has free shuttle service to Universal Orlando parks, SeaWorld, Aquatica, and Wet n’ Wild. Award nights in July cost 20,000 Hilton points. And a paid night costs $129 plus tax. 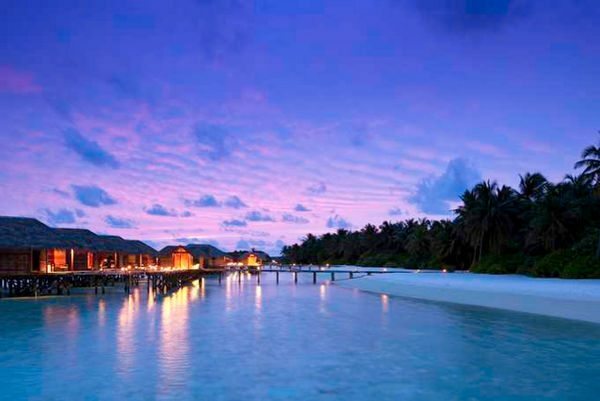 You Could Get 3 Nights at This Hotel for 60,000 Hilton Points. Or Pay Cash for Your 3rd Night and Use Your Statement Credit to Reduce Costs! If you already have at least 10,000 Hilton points in your account, you can get 3 award nights from the Citi Hilton HHonors sign-up bonus (3 nights x 20,000 points per night). Or, if you’ll stay within 3 months of opening your account, pay for the 3rd night. With the $50 statement credit, you’ll only pay $79 plus tax for the whole stay ($129 cost of room – $50 statement credit). That’s a fantastic deal for 3 nights in Orlando! Maybe you’re planning a road trip down to our neck of the woods! 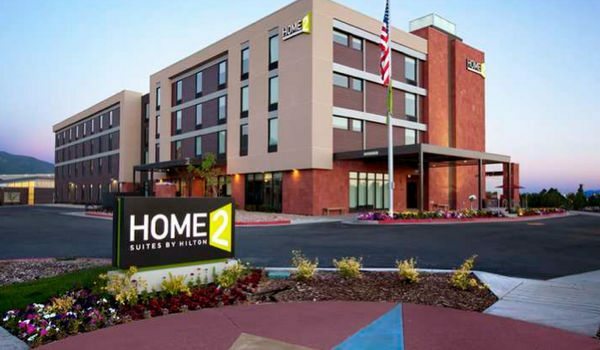 Austin is a popular destination for foodies and music lovers, and the Home2 Suites by Hilton Austin / Cedar Park might be a good spot for folks who don’t mind a bit of a drive to downtown. It’s also received great TripAdvisor reviews. This is a category 3 Hilton hotel, so award nights cost 20,000 Hilton points year-round. And a paid night in August costs $134 plus tax. 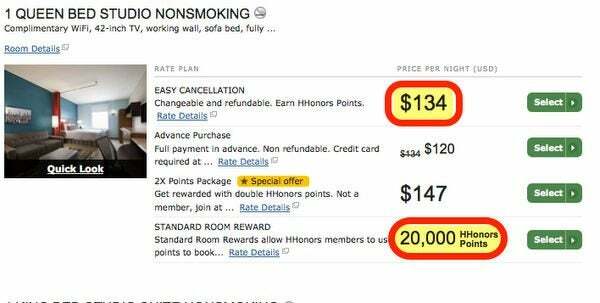 If you used 40,000 Hilton points from the Citi Hilton HHonors sign-up bonus, then paid for a 3rd night, your total cost for a 3-night stay would be just $84 + tax ($134 cost of paid night – $50 statement credit). And you’ll save even more because breakfast is included at this hotel! 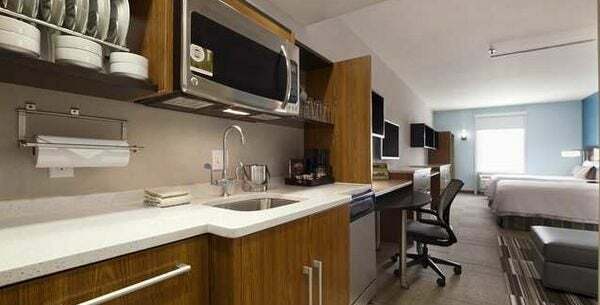 Plus you have the option to prepare meals in your suite, instead of spending money at restaurants. Folks looking for Big Travel overseas can also get 2 or 3 nights from the Citi Hilton HHonors 50,000 point sign-up bonus. For example, the DoubleTree Resort by Hilton Hotel Phuket – Surin Beach in Thailand costs 20,000 Hilton points per night – all year! TripAdvisor reviewers like that it’s close to the beach with friendly staff. Paid nights at this hotel over the summer cost 3,750 Thai baht, or ~$111! Pay 20,000 Hilton Points or 3,750 Thai Baht (~$111) for a King Deluxe Room in Phuket, Thailand! 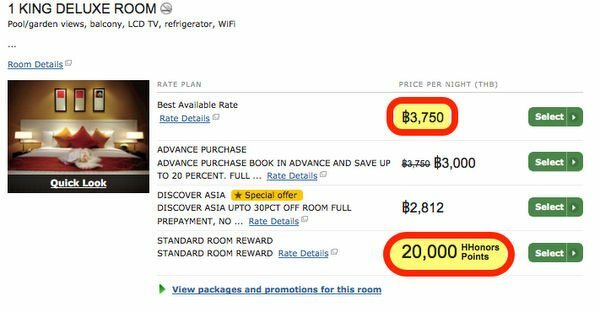 By spending 40,000 Hilton points for 2 nights, and paying for a 3rd, your total cost would only be ~$61 plus tax (~$111 cost of room – $50 statement credit). 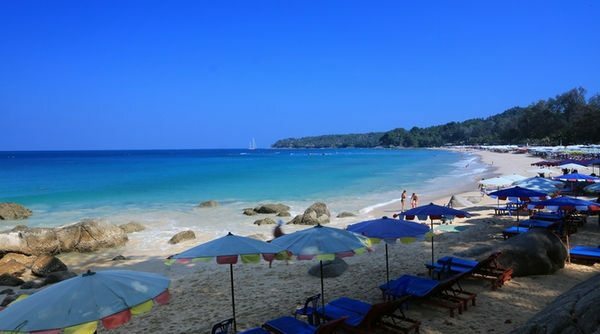 That’s amazing for 3 nights in Southeast Asia on a beautiful beach! If you have a destination in mind, check out the Hilton Points Search Tool to help find lower-category hotels that cost fewer Hilton points! 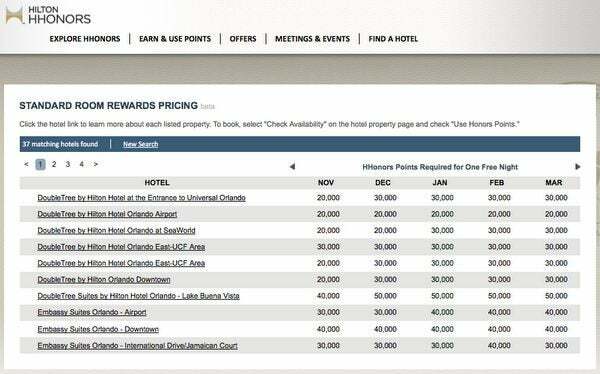 You can specify city and month of travel, and you’ll get a list of hotels with the number of points required for each. To search for any hotel chain in a specific destination, I like to use Hotel Hustle or Award Mapper. You can filter results to only include hotels up to a certain number of points per night. And Hotel Hustle will even tell you if award rooms are available! But I’d Rather Stay in a Fancy Hotel! If luxury resorts and top-tier hotels are more your style, it’s better to apply for the Citi Hilton HHonors Reserve card. After completing minimum spending requirements, you’ll earn 2 weekend nights at (almost) any Hilton in the world! Even the most expensive luxury hotels, like the Conrad Maldives (where Emily and I stayed with our families) or Waldorf Astoria New York! There’s a $95 annual fee, but I’m happy to pay that for Hilton Gold elite status (free breakfast and upgrades) and 2 weekend nights at almost any Hilton! You CAN get both the Citi Hilton HHonors card and Citi Hilton HHonors Reserve, because they’re considered different card products. Keep in mind, Citi only allows 1 personal credit card application per day, and no more than 2 every ~65 days. And you have to wait ~8 days between applications. And if you’ve had either card, you’ll have to wait at least 18 months after you’ve held the card to receive the sign-up bonus again. Remember, Citi cards come with other perks like Citi Price Rewind! You could stretch the limited-time 50,000 Hilton point sign-up bonus from the Citi Hilton HHonors card into a 2 or 3-night stay at lower category Hilton hotels. And many of these hotels are comfortable and have great perks, like free breakfast! You can make your sign-up bonus go even further by paying for another night and using the $50 statement credit for your 1st Hilton stay to reduce the cost. That’s a great deal! Do you stay in lower tier Hilton hotels? Which brand is your favorite? Can you recomend me a hotel credit card for maximun of nights with the bonus points for Paris and London ? Which card gives you more than 3 nights in a 1 category? of any?